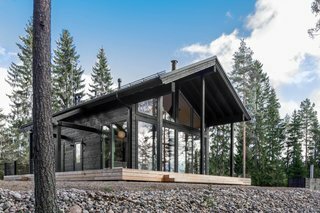 Helsinki-based company Pluspuu offers 11 customizable models of modern log homes and sauna cabins that start at $18,000. 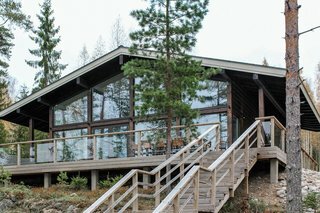 Settled logs that shrink can pose a problem for builders of log homes, as this calls for constant adjustments and maintenance. 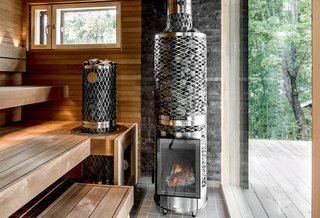 To counter the effect, architects and builders have come up with non-settling systems that prevent logs from sinking and shrinking. 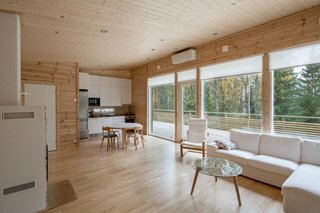 One such innovator is Pluspuu, Helsinki-based designers of high-quality, durable log homes constructed with non-settling logs. 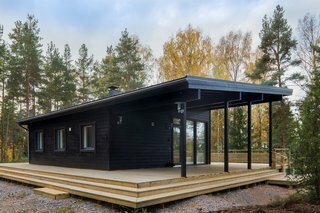 Working with Ollikaisen Hirsirakenne Oy—a builder based in Pirkanmaa, Central Finland, with more 40 years’ experience of log house construction—Pluspuu uses the latest Finnish log construction technologies to create long-lasting, beautiful homes comprised of column-and-beam, non-settling log structures and cross-laminated timber (CLT) panels. 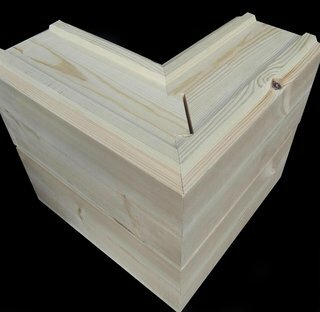 To avoid settling, the centermost lamellas of the spruce or pine logs are laid vertically. 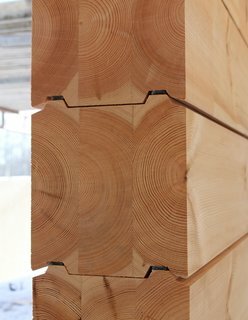 Working with a non-settling log structures allows Pluspuu to incorporate advanced architectural solutions, such as windows and doors without covering strips, and it also eliminates the need for visible external vertical wall supports, which are the norm in traditional log homes. A non-settling framework also means no adjustments are needed for post-construction adjustments of screw jacks, windows, doors, or other features due to settling. Here are some of Pluspuu's sophisticated, modern houses that you can buy and have the Pluspuu team install on-site. 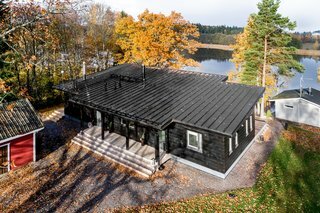 The Kustavi has a monopitch roof, high windows and ceilings, two sheltered terraces, and a master bedroom with either a tall panoramic window or a sliding door. 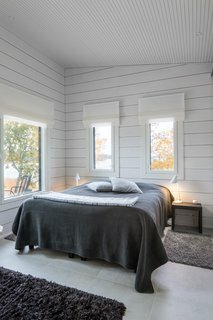 Kustavi is available in sizes that range from 1,291 to 1,340 square feet. Available in sizes that range from 646 to 850 square feet, this model has a sheltered terrace at one end that’s great for outdoor barbecues or a summer kitchen. 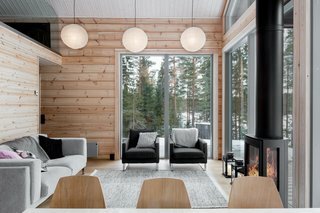 A perfect example of a clean-lined, Scandinavian home, Jurmo has an efficient floor plan with large windows and terraces that promote an indoor/outdoor lifestyle. 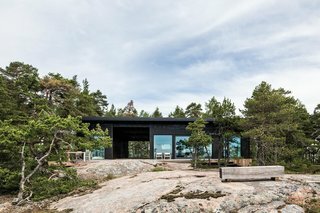 Iniö has a high-ceilinged terrace, and is fitted with generous floor-to-ceiling windows in the living room and dining area that bring in plenty of natural light. Available in sizes that range from 872 to 1,076 sqaure feet, Iniö makes for a spacious holiday or permanent residence. The contemporary Isokari is composed of two buildings that share a roof. 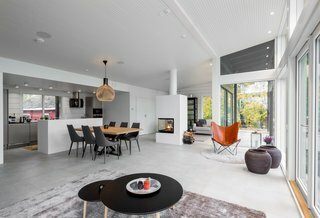 The shared roof creates an efficient terrace between the two structures. Isokari comes with an optional sauna building, but if you don’t need a sauna, this structure can be transformed into two bedrooms with toilets. The Isokari ranges from between 818 to 1,227 square feet. 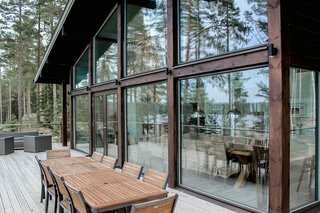 Large glass walls installed within a column-and-beam structure brings in plenty of sunlight, and frames spectacular views for Airisto. 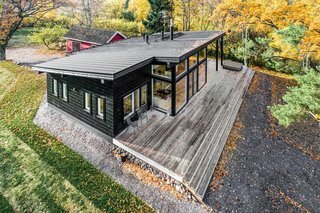 This model, which has a wide, raised interior platform, and a sauna that’s easily accessible via a covered terrace, come in sizes between 904 and 1,356 square feet.